A couple of years ago PIG DESTOYER did a split 3" CD with BENUMB where they released a handful of older, roughly recorded tunes. I loved 'em. In fact I preferred them to the more up to date (at the time) PIG DESTROYER recordings. Now we have a full length CD called Painter of Dead Girls where the band has released 16 (woo-hoo 16!!!) older, roughly recorded songs. Makes me a happy man. These 16 tunes (plus maybe a little something extra) are raw, blood curdling blasts of ultra-grinding mayhem. Deranged and maniacal are adjectives that would only prove complimentary in extreme music and this, my friends, is DERANGED and MANIACAL! 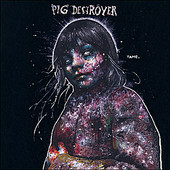 PIG DESTOYER specializes in totally twisted forays into extreme aural abuse and this CD captures them at their best.